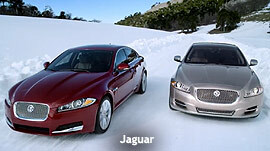 All-wheel drive (AWD) is something one is more likely to associate with Land Rover than its sibling, Jaguar. But the technology will be in the 2013 XF and XJ sedans. It's a use-it-or-lose-it situation for the brand, per Jaguar VP David Pryor: AWD is under the chassis of most luxury cars sold in the snow belt -- obviously -- but the trend is also migrating south. "As we were developing the business case for AWD, we looked at auto registration data," he says. "We set a threshold of 50% AWD. So if you draw a line from east to west, north is 50% and below is less. But in key AWD markets, AWD is 80% to 85%." Pryor tells Marketing Daily that consumers now see AWD as a must-have technology, not a feature for grappling with mountains and going through snow. In sunbelt states the drivetrain is now 15% to 20% of the market, per Pryor. "Luxury consumers want it all. They want the confidence that they can use the car any time." To get the word out about the AWD shift, the brand has launched a campaign. The effort, via Spark 44, an agency partly owned by Jag, also extends the “Alive” campaign launched this year that focused more on Jaguar's core appeal driven -- as it always has been -- by design and now also performance. Pryor says "Alive" has gotten traction because it's not attribute-focused and tactical, as have been campaigns of yore. "When we talk to consumers who have bought or considered Jaguar, what draws them is emotional; we need more people to fall in love with Jaguar, and if we are talking technology in above-the-line advertising we miss the mark." Jaguar is also putting tactical content about design development and engineering on social media with videos and viral content, per Pryor, who says the digital work is moving the needle on changing a perception problem about quality that has dogged the cat for years. "This is hugely important for brand misconceptions; it is a force multiplier if you will, not really about awareness. We track online sentiment, and last year it was negative." He says investing in digital has given a growing number of advocates a place to tout the brand, and has helped give the brand a double-digit improvement in sentiment. "Consumers are our best ambassadors." On the ground Jaguar is in the midst of its 18-month "Alive" tour, visiting 20 cities, and bringing in -- so far -- some 20,000 people by invitation. "We have never done a driving program at this scale," says Pryor, adding that each event brings 1,000 visitors, 80% new to the brand. "We are looking now at how to scale-up experiential activities to more markets."